What’s your thoughts on Australian theme park merchandise. Criteria to consider - price, quality and overall style. 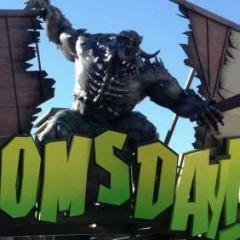 I’m going to say from person experience, Dreamworld is a bit more expensive but the items are better quality. I think these types of designs are really ugly and I don’t like the lightweight material used. However the tower of terror mugs are one of the coolest pieces of theme park merchandise I’ve seen. I don't mind attraction specific shirts for some of the big rides in a park, but what i do want to see more of is POLO SHIRTS. Nice, good quality. by all means go dye sublimation and have a really nice full colour thing like dreamworld, but don't use the same montage of ride photos that means the shirt is dated simply by referencing which rides are still running. Polos in the 90's and 00's were widely available at parks all over - but in the 2010s, the collar seems to have disappeared to be replaced by simple crew neck t-shirts, which is disappointing. hat i do want to see more of is POLO SHIRTS. Absolutely agree. One of my favourite shirts is a Sea World 'corporate' Polo I bought from there a couple years back. It's a very similar design to their Village Roadshow workers uniform which is strange but I really like it. I'd love to see attraction specific Polo's in the same corporate style. Overall though I don't mind Australian theme park merchandise. 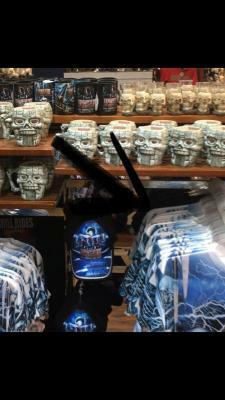 It's understandable that they they're not willing to take a risk on expensive & exclusive merchandise like you see at Disneyland ($100 attraction specific spirit jerseys for example.) but what they offer still allows you to take a little piece of the park home with you. Firstly, I’m not an expert on Theme Park merchandise but I have in the past wondered about a Park’s ethos when it comes to merchandise. Is merchandise an extension of a park’s income? Does it have to make a profit or can it break even? Can merchandise form part of the marketing department? ie, can subsidised t-shirts, mugs, pens, etc be part of an advertising budget as they’re plugging the park in the local community. And then be written off against the tax bill. Ultimately, is merchandise sold to make more money or to promote the business? A couple of years ago, I went to WDW and came home with 2 t-shirts. Whenever I wear them around Perth, I’m always asked about the place. There’s a good number of people who enjoy theme parks /rides and I wonder if public exposure puts ideas in the back of people’s heads? Finally, I do agree that there is a lack of polo shirts at theme parks but being a novice on the matter, maybe they just don’t sell very well. You aren't going to subsidise merch to try and advertise your park. Although Disney would be a talking point to many, you probably aren't getting the same reaction to many others. I wear an assortment of park polos daily - an Avatar experience (Nike) polo, and then usually several VRTP polos including 2 SW (a shark silhouette, and a traditional logo) and then the same silhouette shirt (same colour and all) with the WBMW logo. None of them are talking points... (although my colleagues do know of my affinity for parks, and all too well know not to get me started - so thats probably a contributing factor). All in all, its cheaper to get a t-shirt, and screen print a design on it than it is to embroider a logo on a polo, and that's the major deciding factor - cheaper, quicker, with a higher margin. Is merchandise an extension of a park’s income? A major part of a park's profit comes mainly from F&B and merch. I think what Disney does well in regards to merch is that their product line has both the garishly boiler plate "I WAZ HERE" theme park stuff and also some more subtle, minimal gear that even folks like me who generally shy away from anything that's not a shirt or a basic tee might consider wearing. Polos are awful. They're the kind of daily-wear that's a jack of all trades but the master of none. Personally, If given the choice between a t-shirt and a polo shirt I will choose the polo. It says, this isn't formal, but you have enough respect for the occasion to wear a collar. But... that is my opinion. Exactly. Fashion is subjective. Very, very subjective. It says, this isn't formal, but you have enough respect for the occasion to wear a collar. But... that is my opinion. I reckon polos say "i'm too lazy to iron a shirt." But... that is my opinion. I say it says my wife won't iron my shirts. As I sit here at work in an un-ironed polo shirt. I'm quite open in admitting i'm lazy. I have more important things to do than iron. I'll happily iron up a set of business clothes when the occasion requires it, but that's 2-3 times a fortnight. A polo is more comfortable, and less time out of my day. I say it says my wife won't iron my shirts. As I sit here at work in an un-ironed polo shirt with sauce stains down the front from lunch .